What exactly is a coral? Although corals look like rocks, they are actually animals (note the catchy/creepy(?) video below). They are related to jellyfish and the coral “polyps” that make up a coral colony even look kind of like upside-down jellyfish. Corals create reefs by building white calcium carbonate skeletons. You may have seen these “dead coral” skeletons washed up on beaches, still showing the beautiful patterns built by the coral when it was alive. Inside each coral, live tons of tiny algae called zooxanthellae. These zooxanthellae are plants that give the coral food through photosynthesis and, in return, the zooxanthellae get a safe place to live; everybody is happy. Sounds like a pretty good deal, right? I’ll provide the house, you just have to cook for me. Ok, this might not sound exactly like an ideal relationship to you, but for coral and zooxanthellae, it is a perfect match. 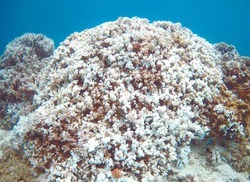 Coral bleaching is when a coral gets too hot and loses its zooxanthellae. Without zooxanthellae, corals also lose their color and turn the white color of their skeletons; hence the name “coral bleaching.” We aren’t sure if the zooxanthellae pack up and leave on their own or the coral kicks them out, but one thing is clear: nobody is happy. You can think of it like any bad break-up: someone gets stressed out, an argument ensues, the relationship ends. But this isn’t just a typical post-break-up, hurt-feelings, empty-house kind of unhappiness. Corals can’t photosynthesize and rely on zooxanthellae for most of their food. This means corals can actually starve to death without their zooxanthellae. Yes, this is a pretty overly dramatic post-break-up response, but that’s the reality. Corals bleach when they get too hot because of the water temperature around them. 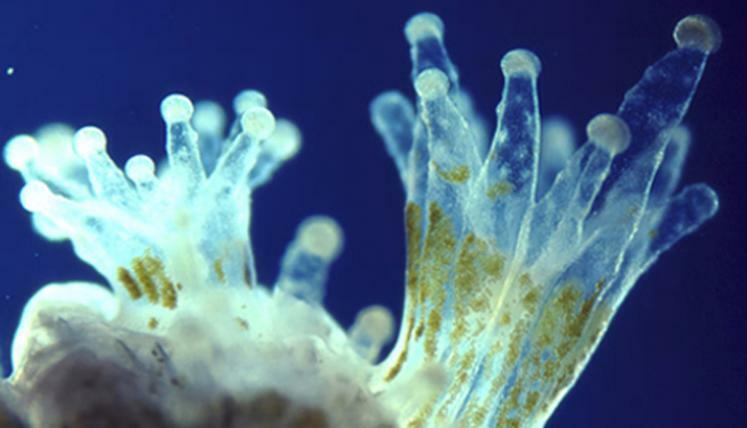 Not only are corals overly dramatic, but they are also very sensitive. A temperature change of only a few degrees for days-weeks can cause a coral to bleach (this takes those fights over the thermostat to a whole new level). Both the degree of temperature change and the duration of the temperature change determine how extensive the bleaching event is. If the temperature only changes a little or only last for a short time, corals can recover from bleaching. The argument wasn’t that bad (“They didn’t really mean the things they said!”), things can be forgiven (“I still love you!”), the relationship is restored, and everyone is happy again. However, if the temperature changes more or lasts for a longer time, this is a very different story. Terrible things were said, gifts were thrown away, phone numbers were changed, the relationship is over forever (“And we are never, ever getting back together“). In this situation, the coral, sad and alone, will starve to death. What is happening in Hawaii? 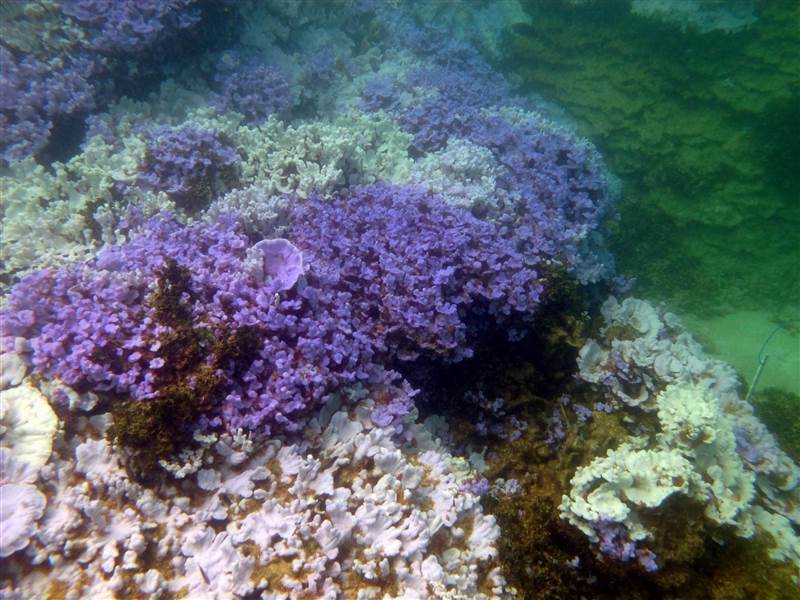 Corals in Hawaii are suffering through the first bleaching event in 20 years due to extreme temperatures. Last month was the hottest September in the region since the 1940’s. Temperatures ~3 degrees F/1.5 degrees C above the normal maximum have been recorded and temperatures are predicted to remain high for 4-6 weeks. This event is affecting ~60-90% of the resident coral species. Corals from the popular tourist destinations of Oahu, Maui, and the Big Island all the way up to the Northwestern Hawaiian Islands Marine National Monument are bleaching. So what is going to happen? Will these corals be able to survive this stressful period and re-unite with their beloved zooxanthellae? 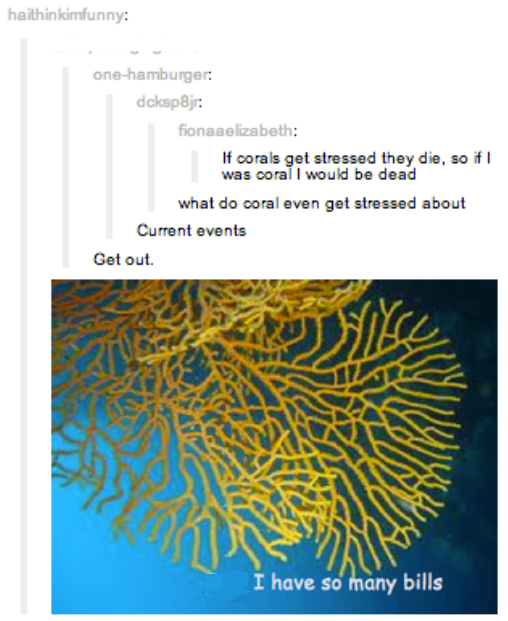 Or will the break-up just be too difficult and cause all of these corals to die? Only time will tell. Tags: Bad Break-Ups, climate science, Coral Bleaching, coral reefs, Corals, Hawaii, Zooxanthellae. Bookmark the permalink. Previous post ← She Smells Seaweeds by the Seashore: Why is the Ocean so Darn Smelly?